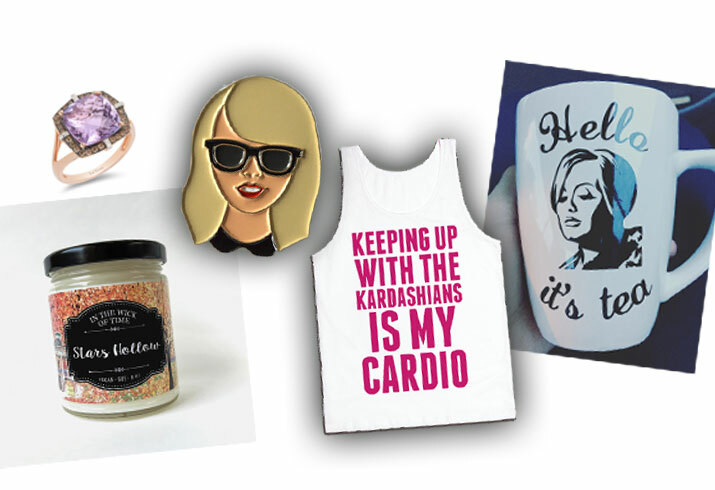 Your pop culture friends will love these presents from you. Many fans were shocked when Prince passed away earlier this year, but artists like this one are helping fans remember the "Purple Rain" singer's legendary life. For your Taylor Swift-obsessed pal, check out this simple and classy pin of her. Your celeb pals have surely seen stars breaking out their chokers this year, and you can't go wrong with this black and gold leather one. When it was revealed Gilmore Girls was getting a reboot, it was one of the most talked about topics on social media — and this Stars Hollow scented candle is a perfect addition for those binge-watching nights! Everyone has at least one friend in your camp who can't get enough of the Kardashians, so surprise them with this tank top. When Adele returned to the spotlight, her "Hello" song stole the top spot on charts for weeks, and this mug is perfect for someone who can't stop talking about her! And if you're really looking to surprise a celeb fanatic and a jewelry lover, this Le Vian Red Carpet 14K Strawberry Gold ring with 4.5 total carat weight of Cotton Candy Amethyst and .28 total carat weight of Vanilla and Chocolate Diamonds has been starting to pop up on celebs this year!